Attending the Academy of Beauty Professionals opens up the opportunity to use your creativity in an amazing career. However, we know it can be overwhelming to start a new career or go through the process of changing careers, but we’re here to help! 1. Fill out our “Connect with Us” form down below, or visit our Connect page to fill out the form. Our admissions team will then reach out to you to schedule a career planning session. 2. Attend your scheduled session! This is an exciting experience because it really allows you to discover if this is the right career path for you. It is important for our admissions team to learn about you, so they can guide you through this decision-making process and be there to answer any questions you may have. Feel free to bring a guest to your career planning session! 3. Complete the application process with your admissions representative. 4. Submit scholarship and/or tuition discount paperwork. 5. Complete your FASFA and financial aid paperwork. Our FASFA School Code is: #014819. The School Name, “House of Heavilin, Blue Springs, MO” will be the listed school. This is correct. Academy of Beauty Professionals is a branch campus of House of Heavilin, Blue Springs, MO. 6. Bring your high school diploma, GED, or HSED – or contact your high school and ask them to send us your official final transcript. 7. Stay in touch with your admissions representative and get ready to start your exciting World of Beauty! 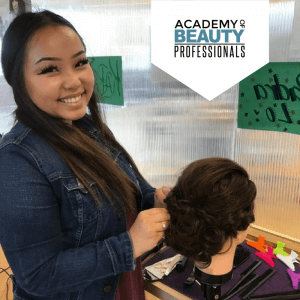 WHY ATTEND THE ACADEMY OF BEAUTY PROFESSIONALS? • Small student-to-instructor ratio. Get the education and attention you deserve when paying for an education! • Learn modern techniques and technology, so you can provide salon and spa services in confidence. • Hands-on, interactive learning. Learn how to interact with clients in a professional setting. • Participate in a casual learning environment. No uniforms and no lectures – group discussion and self-expression is welcome at ABP. • Learn from some of the best! 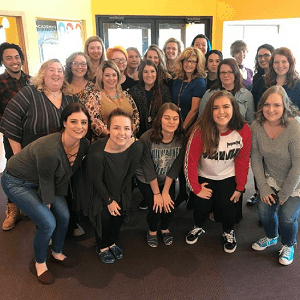 Martin’s family (now known as Academy of Beauty Professionals) has over 70 years of salon experience and has trained thousands of beauty professionals. • Gain experience in a different number of product lines. Graduate from ABP with an understanding of multiple product lines – giving you versatility in your career after graduation. • We offer exclusive lessons on people skills and the salon business to give you that competitive edge you need to be a success in the beauty industry. • Discuss job placement, work on interview techniques, resumes and portfolios. Graduate from ABP career ready!